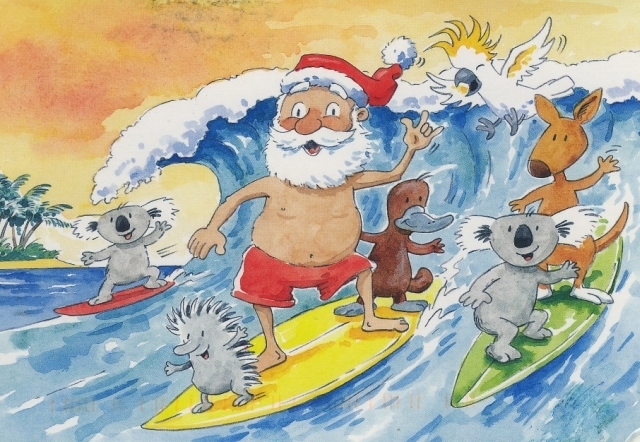 The Friends of the Heysen Trail office will close for the Christmas period at 2:30pm this Friday, December 14th 2018. Our volunteers have earned a good break. If you need to contact the office (by email or telephone) over the holiday period, it is unlikely that we will respond to your enquiry until we reopen. So we recommend that you refer to our website for any information you may need. There will be a Volunteers Information Day on Monday, 4th February 2019 with normal office procedures beginning on Tuesday, 5th February. While the office is closed, our online shop will remain open for business. However, as many of our volunteers will be on holidays, it may take longer than normal to service orders. We will endeavour to dispatch shop orders within 5 business days. If you want to shop for last minute Christmas purchases we undertake to dispatch any orders received by midday on Monday, December 17th, on that day. Remember that the Heysen Trail is now closed for the Fire Danger Season. You can access more information about the trail closure here. Although the office and the Heysen Trail are closed, don’t forget our Wednesday evening Twilight Walks. You can register for walks using our online Walks Calendar. The Office Volunteers wish all Friends members and supporters a Merry Christmas and a great New Year. The End of Year Bash is on again. 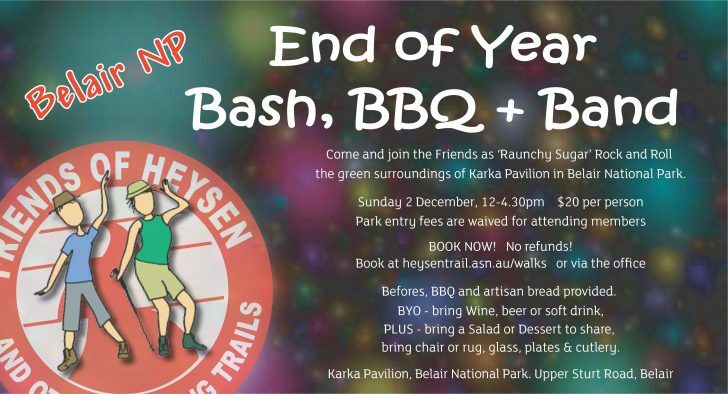 Make sure you are at Karka Pavilion, Belair National Park for lunch and fun on Sunday December 2nd 2018. 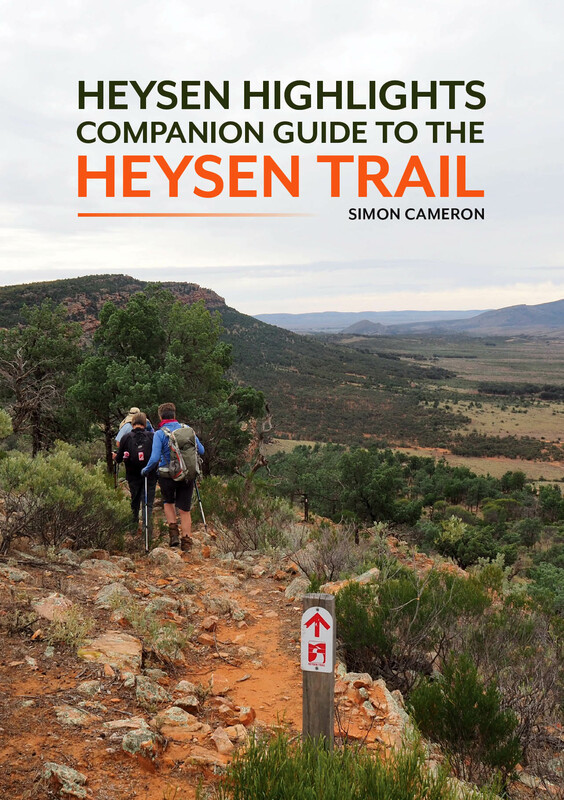 This year we have something special – we also are launching ‘Heysen Highlights’ – Simon Cameron’s companion guide to the Heysen Trail. 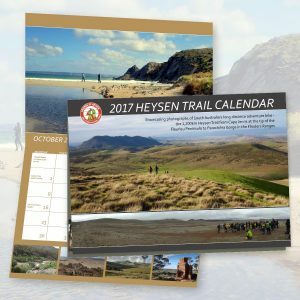 The book has 264 pages with many colour photographs and will make an ideal gift and trail reference. To celebrate the launch, copies will be available for sale at the Bash, at the one day only special price of $30. 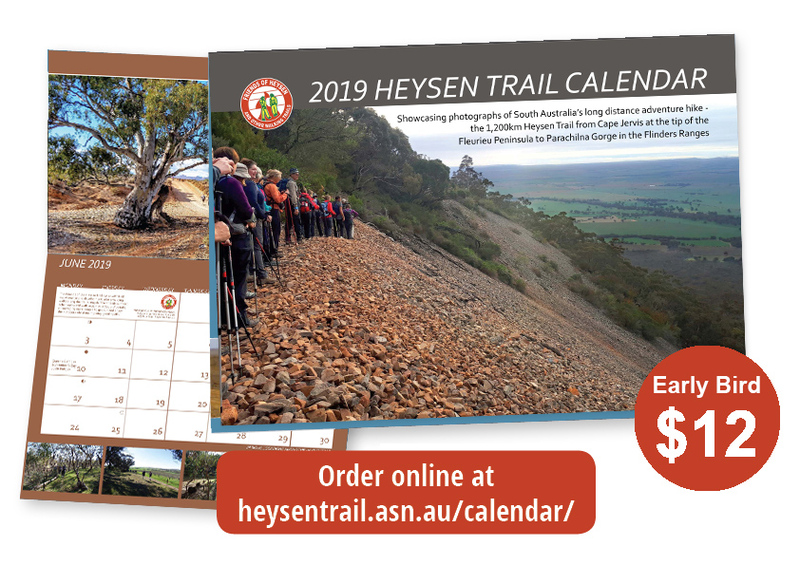 “ The Heysen Trail is a 1200 kilometre adventure hike which runs along the rugged spine of South Australia. From the Southern Ocean’s cliffs and beaches to the northern deserts. It is Australia’s most diverse trail, over varying terrain and filled with a multitude of stories. 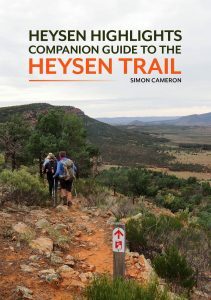 In this companion guide The Heysen Trail is broken into 58 sections, each comfortably walked in one day. For each day there is a brief overview of what to expect and what to look out for. Simon will be there to personally sign any copies purchased on the day. Make sure you get your copy. Raunchy Sugar are returning as ‘The Band’, so this year don’t miss out on a very special event. Get your End to End group or walking friends organised and be there. Come along to Rock and Roll or maybe just relax amongst the lush green surroundings of Karka. The Friends will provide: Befores, BBQ meat and artisan bread. BYO – wine, beer or soft drink, Bring a Salad or Dessert to share. Don’t forget a chair or rug, glass, plates & cutlery. Book early! $20 per person. No refunds! Book at: heysentrail.asn.au/invite or via the ofﬁce. To assist with catering, bookings close on Friday November 30. Park entry fees are waived for attending members and guests. We will have Friend’s 2019 Calendars at the Bash for sale at the discounted price of $12. If you’ve already ordered a copy for collection, you will be able to pick it there. 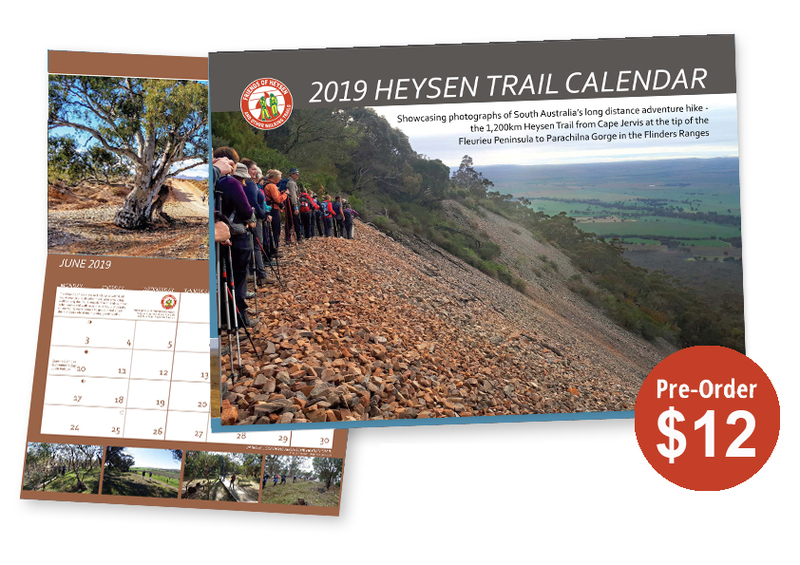 Reminder – Friends of the Heysen Trail 2019 calendar available for immediate delivery. 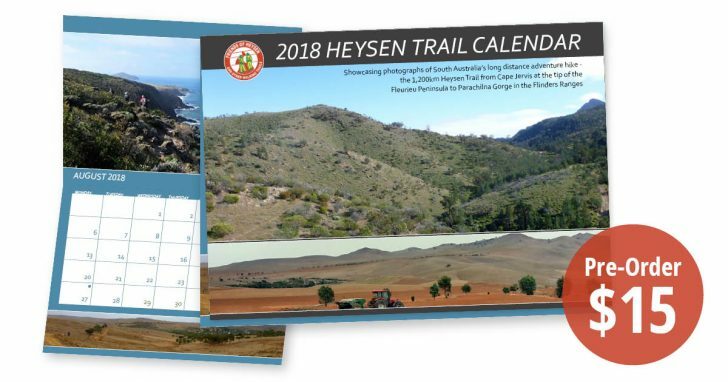 The Friends of the Heysen Trail 2019 calendar has been delivered to our Office and is now available for immediate delivery. Make sure you order your copy of the calendar before December 1 to qualify for the discounted price of $12.00. Get one for your wall at home or work or buy some as Christmas gifts for family and friends. However, if you can’t pick up the calendar, the Office volunteers can also arrange to have it posted to you or your gift recipient..
Friends Office will close this Friday for Christmas. The Friends will close our Office for the Christmas period at 2.30 pm this Friday, December 15th 2017. Our volunteers have earned a good break, so we will reopen at 10.30 am on Monday 5th February 2018. If you need to contact the Office (by email or telephone) over that period, it is unlikely that we will respond to your enquiry until we reopen. So we recommended that you refer to our website for any information you may need over the office closure. While the office is closed, our online shop will remain open for business. However, as many of our volunteers will be on holidays, it may take longer than normal to service orders. We will endeavour to despatch shop orders within 5 business days. If you want to shop for last minute Christmas purchases we undertake to despatch any orders received by midday on Tuesday December 19th, on that day. Remember that the Heysen Trail is now closed for the Fire Danger Season. You can get more information about the trail closure here. The Office Volunteers wish all Friend’s members and supporters a Merry Christmas and a great New Year. The Friends 2018 Calendar ‘early bird offer’ ends this Friday. Hurry, order your copy of the Friends 2018 Calendar now. The Friends 2018 Calendar pre-publication discounted price offer ends soon. The presses are nearly ready to roll on the production of the 2018 Calendar. Submit your order before midday on this coming Friday, November 3 and catch the pre-publication discount price of $15/copy. After then limited numbers will be available at $18 each. Expected delivery date is late November 2017. The Friends 2018 Calendar showcases our member’s photographs of South Australia’s long distance adventure hike. The 1,200km Heysen Trail extends from Cape Jervis at the tip of the Fleurieu Peninsula to Parachilna Gorge in the Flinders Ranges. The calendar is an A4 wall calendar, which opens up to A3 size. Purchase it on line or contact the Friends Office. Purchase online via our online store, or to place a ‘pick-up’ order direct via the office (phone 08 8212 6299, Mon-Fri 10.30am – 2.30pm). For on-line store orders, postage to anywhere in Australia is $4.50/single copy. Arrange to pick up your copy at the Office or the Friends End of Year Bash. We plan to have copies available to pick up at the End of Year Bash, BBQ and Band at Belair National Park on Sunday December 3. If you want to join us at the Bash, you can book at: heysentrail.asn.au/invite or via the ofﬁce. 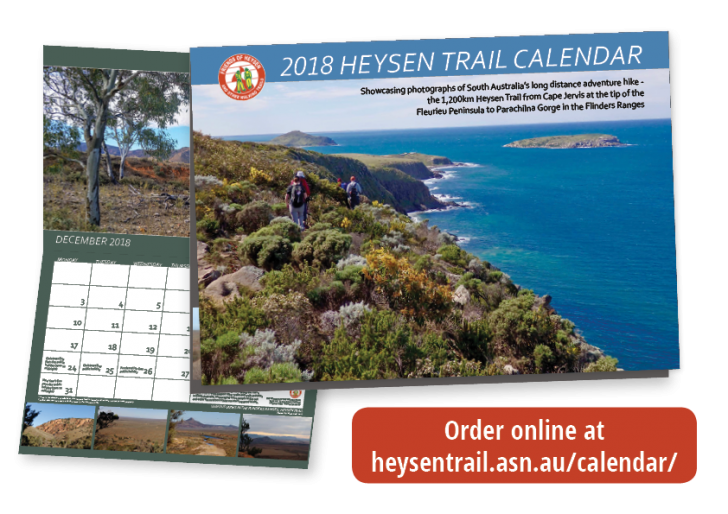 The Friends of the Heysen Trail 2018 calendar photos and orders. The Friends of the Heysen Trail 2018 calendar is currently being compiled and will soon be available. Submit some of your photos for the 2018 Calendar for a chance to win a free copy. Photos need to be landscape shaped and meet minimum technical specifications. Generally a 7 mega pixel camera will suffice if on the highest image quality setting. There is a maximum of four photos per person. If your photo is selected for inclusion in the calendar, you will receive a complimentary copy. Closing date for contributions is this Sunday, October 15 2017. Email size can be up to 25MB ( however your email provider may not allow emails of that size). Get one for your wall at home or work or buy some as gifts for family and friends. We expect to have copies available for delivery by the end of November. You can also order the calendar from the Office. Contact us either by phone or email. If you can get into the office you can take delivery yourself. Alternatively, we expect to have the calendar available for pick up at our End of Year Bash at Belair National Park on Sunday December 3. However, if you can’t pick up the calendar, the Office volunteers can also arrange to post it to you. Friends Office will close for Christmas. Our office will close for the Christmas period at 2.30 pm on Friday December 16th 2016 to give our volunteers a well-earned break. We will reopen at 10.30 am on Tuesday 17th January 2017. If you need to contact the Office (by email or telephone) over the break, it is unlikely that we will respond to your enquiry until we reopen. If you want to shop for last minute Christmas purchases we undertake to despatch any orders received by midday on Tuesday December 20th, on that day. Don’t miss out! The Friends 2017 Calendar ‘early bird offer’ ends on Monday. Don’t miss the wave! The Friends 2017 Calendar pre-order discounted price offer ends soon. Although it’s not December yet, the presses are nearly ready to roll on the production of the Friends 2017 Calendar. Submit your order before midday on this coming Monday, November 21 and catch the pre-publication discount price of $15/copy. Orders made after that will be at the normal price of $18. Purchase online via our online store, or to place a pick-up order direct via the office (phone 08 8212 6299, Mon-Fri 10.30am – 2.30pm). We plan to have copies available to pick up at the End of Year Bash, BBQ and Band at Belair National Park on Sunday December 4. If you want to join us at the Bash, to assist with catering arrangements, bookings for the Bash close at 2.00pm on Wednesday November 30th. Book at: heysentrail.asn.au/invite or via the ofﬁce. Check out more information on the Bash here. Showcasing photographs of South Australia’s long distance adventure hike – the 1,200km Heysen Trail from Cape Jervis at the tip of the Fleurieu Peninsula to Parachilna Gorge in the Flinders Ranges. An A4 wall calendar, opening up to A3. 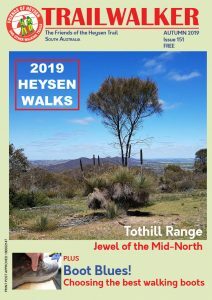 Photos submitted by Friends of the Heysen Trail members and Heysen Trail hikers. Pre-order now for just $15 per copy. Postage from as little as $3.75. Available late November at $18 per copy. Available for delivery or pick-up in late November-early December.